Do you appreciate a personalized experience? Close your eyes and think about the last time you had a personalized experience and how it made you feel. Maybe it was a personalized workout prepared for you at the gym, or the comfort of having your car automatically adjust the seat to your specifications when you slide in to take a spin, or the barista that starts preparing your specialty drink as you walk in the door. A personalized experience establishes goodwill, increases loyalty, and brings a smile to your face. So when we planned our research calendar at Ascend2, we knew that personalization was a topic we needed to cover. But not just basic personalization, like including a prospects first name on an email, but the next step in personalization: hyper-personalization. 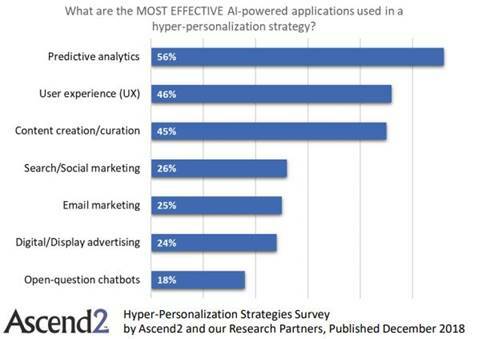 Hyper-personalization takes personalized marketing a step further by leveraging artificial intelligence (AI) and real-time data to deliver more relevant content, product, and service information to each user. 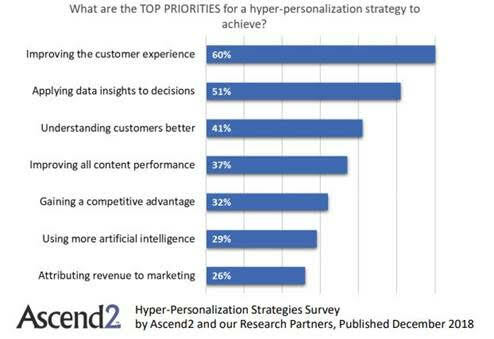 But what will hyper-personalization strategies look like in the year ahead? Answers to this question are found in the new Ascend2 research report, Hyper-Personalization Strategies. The survey was fielded the week of November 26, 2018, and a total of 143 marketing professionals participated. Here are a few of the survey results and some ideas on how you can use the findings to plan your 2019 marketing strategy. Only 9% of marketing professionals surveyed say they have completed the development of a hyper-personalization strategy. These are the early adopters. The majority, 62%, are either just talking about it or haven’t done anything about hyper-personalization yet. So if you start now and create and implement a hyper-personalization strategy, you will be a step ahead of your competition. Remember, “if you’re not the lead dog, the view never changes.” Be the lead dog and create a hyper-personalization strategy for your company. Improving the customer experience and applying data insights to decision-making are top priorities for 60% and 51% of marketing professionals, respectively. Any time you can improve the customer experience, you will reap the benefits. The more data you have about your audience, the ability to understand and learn from the data, and the skill to apply what you learn to customize the experience, will help you improve your marketing performance. 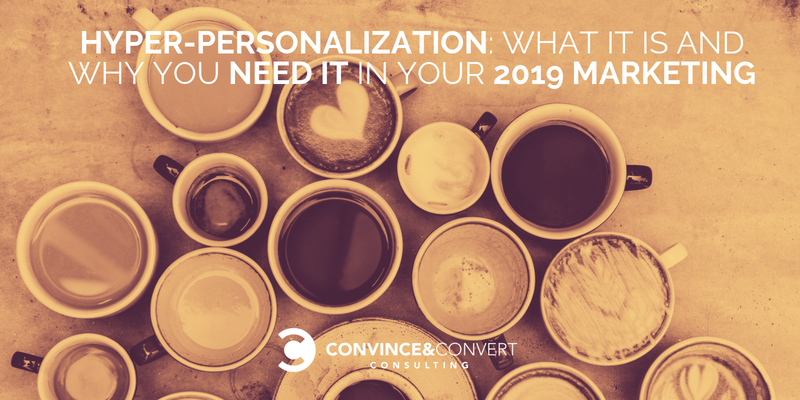 Keep your top priorities in mind as you create your hyper-personalization plan and refer back to your priorities as you evaluate your strategy. Ask the question: Is my strategy meeting my top priorities? Be careful not to implement a “cool” technology if it is not helping you meet your top priorities. Tactically, the AI-powered applications used most effectively in a hyper-personalization strategy are predictive analytics, user experience (UX) and content creation/curation applications. If you need a place to start, review what is most effective based on the research below and determine what the best fit for you is. If content marketing is a primary marketing tool for your company, examine AI-powered apps that can be used in a hyper-personalization strategy. There are some great CMS tools that use AI to achieve amazing personalization of content. 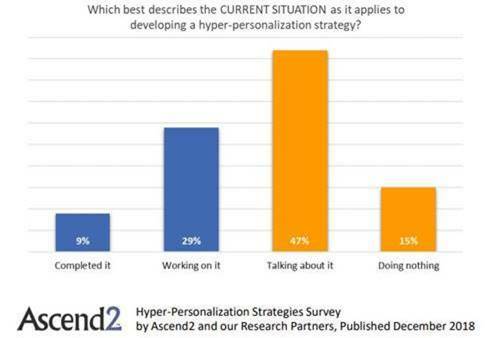 Good News – Hyper-Personalization Works! A total of 86% of marketing professionals consider the effectiveness of an AI-powered hyper-personalization strategy to be changing for the better, with nearly one-third (31%) considering the change to be significant. So your investment in AI-powered hyper-personalization will make a positive change — you just need to get started! You can review the entire Hyper-Personalization Strategies Survey Summary Report for guidance on creating your email and content marketing strategy. As a Partner and CMO of Ascend2, Todd helps connect marketing firms to prospective clients with the power of research. His background includes more than 20 years of marketing and content experience with MarketingSherpa, Kiplinger and the National Institute of Business Management.